Here’s a check list for getting your home theater up and running. Ideally, your home theater needs a room large enough for a setting area and some distance between the screen and speakers. Ambient light should be minimum and you’ll also need ceilings high enough for mount your projector. Today’s digital projectors handle a wide variety of media from video, TV, photos or documents. The type of digital projector you buy will depend on how you’re going to use it. Home theater projectors are generally used in completely dark room, so don’t need to bright as home projectors. A general TV projector used in a bright room with more ambient light may need a brighter projector. It may be worth spending a big more money for a projector that can handle different types of lighting with more focus options. Look for a projector with a lens shift option if you will be changing locations of the screen. A high definition TV projector will give you the clearest picture and sharpest colors for your home theater. Any home theater also needs a screen and that is dependent on your ceiling. Ceiling height controls screen height and width and ultimately how far back your projector will need to be. Any screen must be at least three feet off the floor. The formula for screen height is to subtract three feet from your ceiling height to get your maximum screen height. Low ceiling present some challenges and may require either a smaller screen or a short-throw projector. Look for a projector with a lens shift option. One of the most important considerations when setting up your home theater is looking at the aspect ratio as well as the projector’s gain. Read more about screens and their material. Good sound is an important as the screen. With your home theater, the speakers are not going to be next to the projector so you’ll need some connecting cables to hook up everything up. You can forego the cables and use a wireless connection for your speakers. If there isn’t room for cables or you don’t want unsightly clutter, you can also invest on wireless speaker. A Sound Bar system produces a surround sound listening environment using one speaker box. An AV input switcher is also an important piece of equipment by allowing you to swap between your different video sources such as your computer, DVD player or BlueRay device. Building your home theater takes some time. Start off gradually and build up. If you need more advice join the FixYourDLP forum or the AV Forum where a community of experts are waiting to help you with your home theater. I liked that you pointed out that any screen will need to be at least 3 feet off of the floor. That isn’t something I would have thought about when looking for a movie screen. It does seem like the type of screen you get could really make or break your home theater. Absolutely right! 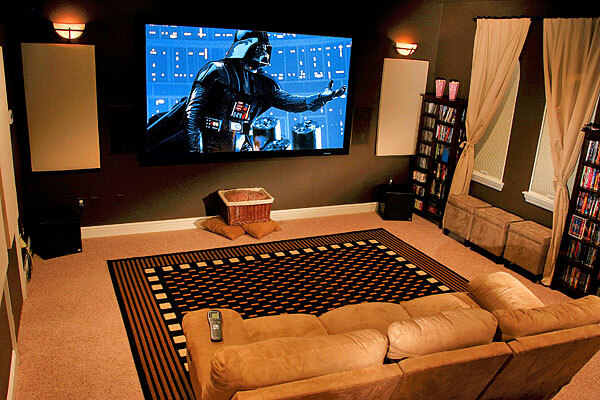 Your screen is a crucial part of the home theater but is often overlooked. Glad we could help you out. Thanks for the response.